Mount Norquay is home to Banff's only Via Ferrata. Via what? Italian for 'iron road', a via ferrata is a system of secured cables and "ladders" - metal handles and footholds - that allow nonclimbers to access gnarly terrain. Traverse exposed cliffs and swaying suspension bridges, all the while attached by your harness to sturdy cables. 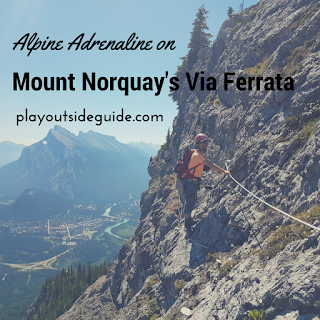 Built in 2014, Mount Norquay's via ferrata boasts four exciting routes. The newest Summiteer Route just opened this month, and we were among the first to try it. 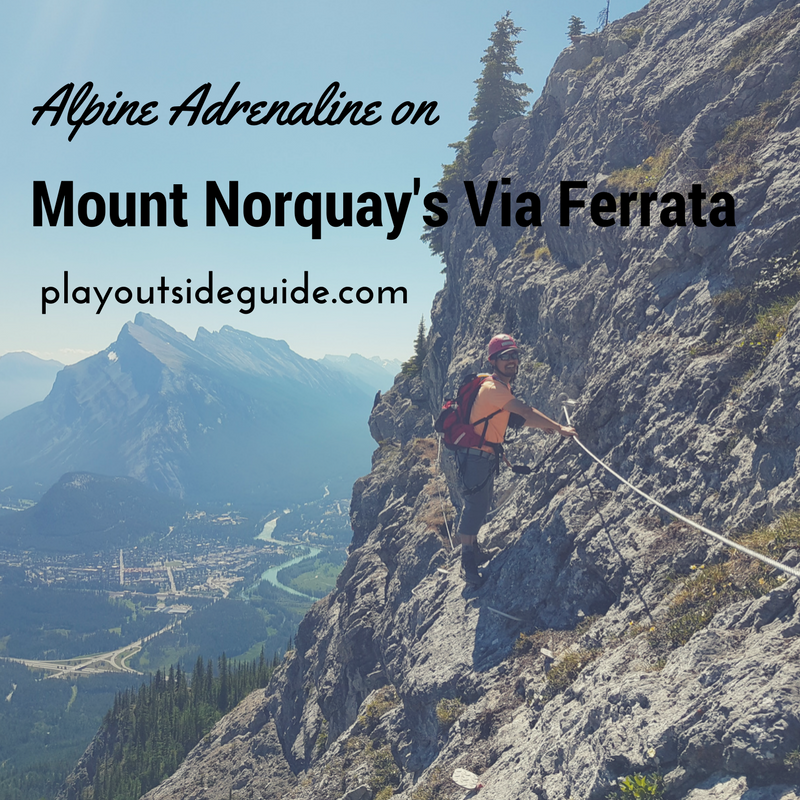 It is the longest (6 hours) and most challenging route to date and goes to the east summit of Norquay. We loved every minute of this adrenaline-filled adventure and will be taking our kids when they are bigger! "Go cable to cable with your right; and cable to rung with your left." Chris's calming 'doula voice' coaches me through the transition from cliff face to airy ladder. Now, facing out, over a dropoff, I must climb two rungs, move a locking carabiner to the highest rung I can reach, then repeat, until I reach the top. From there, I will clip in to a cable on the mountainside and traverse the exposed, skyline route. I take a deep breath as my heart thumps wildly, try not to look down, and focus on the epic view before me. It's mind over matter - I remind myself that it's just a ladder and I'm totally safe - and soon I'm at the top watching my husband climb up. "Has anyone ever frozen?" Sierra asks. "Yeah, we call them Klingons!" our guide, Chris, says tongue-in-cheek. He then tells us it's almost never happens and that it's rewarding to see people overcome their fears. With camaraderie on the cables and Chris talking us through the tricky bits, no one in our group freezes! At times, it seems like we're doing our own stunts in an action movie! We traverse cliff faces and swinging suspension bridges - one 55 metres (180 feet) long - and climb tiny metals "stairs" (maybe 2" wide) on the rock. At one point, Chris tells us to have a snack because we'll be climbing straight up for an hour! My favorite part is the 3-cable suspension bridge near the summit. With unobstructed views, you can see up, down, and all around. Partway across, I peer down at my tiny shadow while a raven circles overhead. 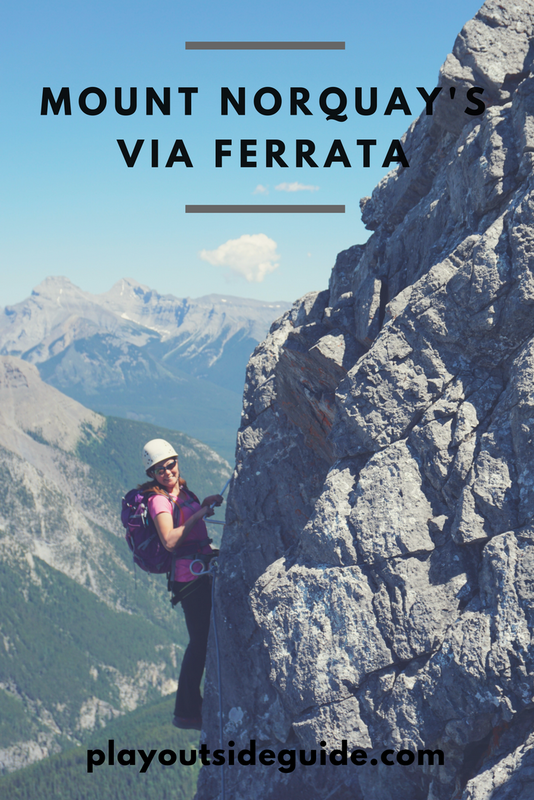 Thanks to thick steel cables secured by fixed anchors, and conveniently placed steel steps and handholds, no climbing experience is necessary to enjoy the thrill of the via ferrata. Although the terrain is extreme, the danger is not - provided you wear the required safety gear, and stay clipped in properly at all times. It is safer than scrambling as you are always attached to the cables by at least one locking carabiner (2 while you are moving). Our guide assures us that the cables can easily support the weight of a truck (40,000 kg actually!) and there has never been an incident at Norquay. The long 55 m (180 foot) bridge! Almost 4 hours after we started, we reach the east summit of Mount Norquay, 2450 metres (8038 feet) above sea level. Chris points out prominent peaks including Cascade, Rundle, Assiniboine, Sulphur, and Louis.With beauty all around and adrenaline coursing through our veins, we are on a mountain high. As we fuel up for the return trip, I ask my fellow Summiteers what the most exciting part was. While the vast majority claim the 3-cable suspension bridge was the most exciting and scary at the same time, you wouldn't know as they crossed it smiling. "My hands were sweating," Kheang confides. Teranie and I, however, found the ladder to be the most sweat inducing. Everyone's experience is unique, but one thing we can all agree on, is that the summit is sweeter after our efforts and the panoramic views are picture perfect. After a downclimb off the summit hump and one more dance across the monkey bridge, we make our way down. Most of the descent is a hike, but steeper sections have cables for our safety. Back where we started, at the top of the chairlift, we say farewell to our trusty harnesses, leashes and helmets, and head in to the Cliffhouse Bistro for the apres. We enjoy a climbing platter and beverage (on the house) and exchange email addresses so we can share photos. Our friend, Tatjana, and kids are waiting for us and they tell us about their adventure on Stoney Squaw Summit. The first thing the girls ask, after seeing our via ferrata photos, is "When can we go?" 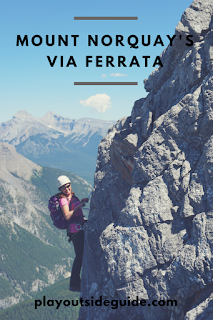 No climbing experience is required, but you should be fairly fit to do the Via Ferrata as you will be climbing straight up a lot of the time. The new 6-hour Summiteer Route is 3.2 kilometres (2 miles) with 450 metres (1476 feet) of elevation gain. It sounds short, but allow extra time (it took our group 7 hours). The minimum age is 15 years old. Other routes available for ages 12 & up: Explorer (2 hours), Ridgewalker (4 hours), and Skyline (5 hours). The shorter routes are less strenuous and don't go across the 3-cable suspension bridge. Summiteer Route includes: Bagged lunch (make your own sandwich, fruit, water), and apres climbing platter and beverage at Cliffhouse Bistro. 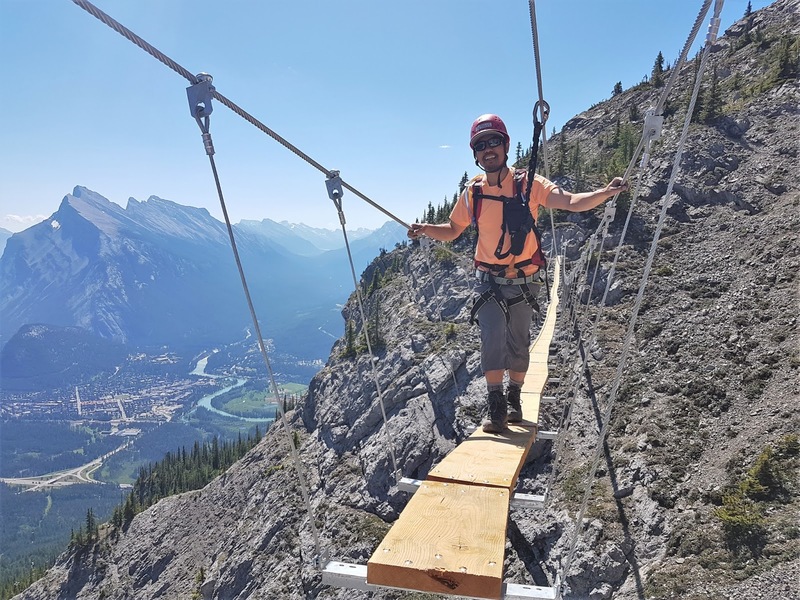 Check out Mount Norquay's Via Ferrata FAQs for more information. Mount Norquay is accessed via a beautiful, short drive (or free shuttle bus ride) 7 km from downtown Banff. Park at the North American Lodge; parking is free. Note: The road has several switchbacks, so trailers should be left at camp. 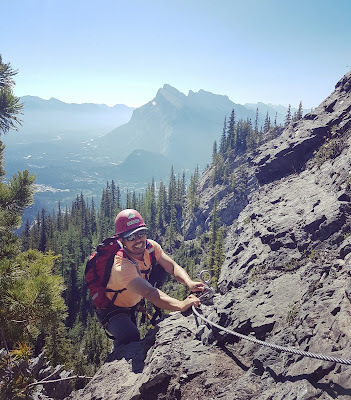 To learn more or book YOUR Mount Norquay Via Ferrata adventure, please visit https://summer.banffnorquay.com/adventures/via-ferrata/. Read about our experience at: Mount Norquay Sightseeing Chair Lift & Cliffhouse Bistro. 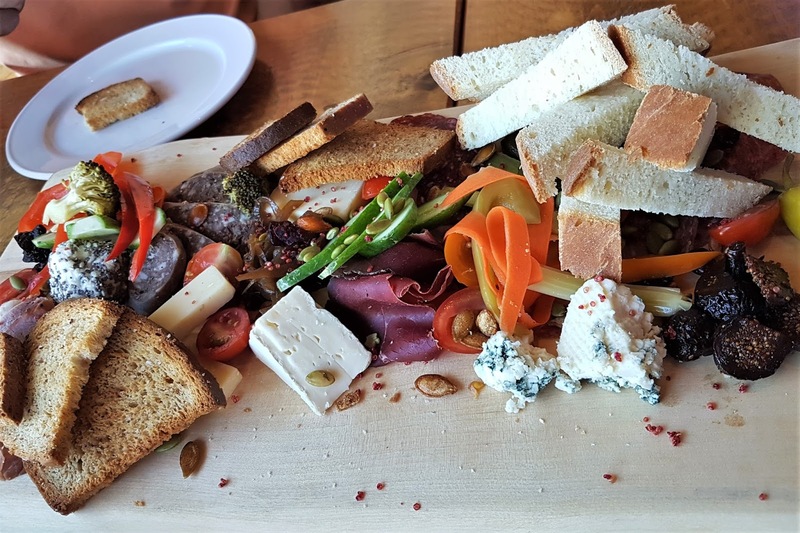 Enjoy delicious food with the best view in Banff! A huge thank you to Mount Norquay for hosting us on this epic adventure! Sounds amazing, I am sure my boys would love to try this.